Jeppe Hein articulates a lively and often unexpected dialogue between his work, the viewer and the site of intervention. While his sculptures refer to Minimalism and question the authoritarian nature of the museum or gallery exhibition space, his method necessitates that the audience physically trigger the work. For his first solo exhibition in Berlin, the young Danish-born artist Jeppe Hein presents a work in simple but effective dialogue with the traditions of Minimalist sculpture and the witty and self-conscious mode of institutional critique. Questioning the ritualistic relationship between art and the spectator, Hein creates witty and minimalist installations that intervene with both indoor and outdoor spaces deliberately blurring the boundaries between conceptual art and mechanical objects. If you thought contemporary art was cold and detached, you’ve probably not encountered Jeppe Hein. The Danish-born, Berlin-based artist is one of Europe’s most confrontational artists, with his works not only challenging the viewer, but directly involving them in the process. The simplified mirror labyrinth will resemble the historical Greek labyrinth, with its quadratic floor space, interlocked geometric channels and with one entrance. As a model for a more active participation in the reception of art, my work represents a reference to the traditional shapes of such a maze. 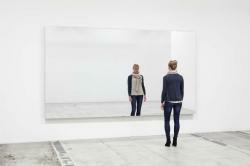 - Jeppe Hein triggers Bodø with interactive art. Jeppe Hein's' artworks are usually interactive. It means that the participation of the audience is central. He is foremost concerned with exploring how the presence of the audience influences the piece and the experience with art. In acorner gallery of PS1 at the new Spring exhibition, asmall white cube floats in the center of the gallery as white cube. The wall text explains that Jeppe Hein’s Flying Cube is held up by an electromagnet concealed in the tube that hangs down from the ceiling. Hein says he wanted to immediately dispel any mystery about this gravity-defying installation. "I don’t want people to waste time in their head wondering how it works. How it makes you feel is more important." The work of Jeppe Hein could best be described as "con-struction". 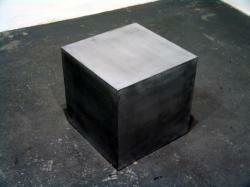 The sculptural installations are functional physical constructions with a specific purpose, a utility.